You never know where a video, a comment to a family member or a blog post will lead. Online fundraisers constantly ask each other whether you can truly measure the impact of social media. The answer: some you can, some you can’t. A few years ago I tracked down one long and winding road to create a mind map to try to better understand how it works. In the fall of 2008, at Heifer International, we’d noticed some donations—a few thousand dollars—coming in from a fantasy writer’s blog. I called Patrick Rothfuss to thank him and quickly learned he was a consummate people person. And he was recruiting fellow fantasy and sci-fi authors to donate signed books and other literary objects of desire. These were being auctioned off to fans with the proceeds going to Heifer (Pat had pledged to match what they gave). He and a few volunteers were tracking the activity and shipping the books from his home to readers across the country. I asked Patrick Rothfuss where he heard about Heifer. Turns out, he’d seen a video by singer Sarah McLachlan, who knew of Heifer because her aunt had served on its board of directors. He’d shown the video in his university class. When he mentioned it to his mom, he learned that she’d been a long-time supporter through her church. Meanwhile, and unrelated, author Neil Gaiman had heard about Heifer from two different sources: a blog and an honor gift card from a friend. So he posted something about Heifer on his blog. My Brooklyn friend Chris — we had earlier talked about reading Gaiman — saw Gaiman’s blog and mentioned it to me. So in my second call to Patrick Rothfuss, I told him that Niel Gaiman was also a Heifer fan. Rothfuss says he’d recently met Gaiman and had his card. So he told him of the fundraiser. Gaiman’s immediate post about the campaign was seen by jillions of his fans, including a woman named Zoe. She is the daughter of popular mystery writer Laurie King, and does her online publicity. So she reached out to Heifer to start a different campaign to coincide with Sir Arthur Conan Doyle’s 150th birthday. This raised another $30,000 over the next two years. Others got involved: the Wheel of Time series ran an auction; the band Creed donated a signed guitar; and pretty much every sci-fi or fantasy writer in the world (for example, George R.R. Martin) seemed to have joined the effort. So by the end of the first two years, the combined efforts had raised more than $300,000 to help struggling families around the world through a gift of livestock and training. Five years in, a The Denver Post article in late 2012 describes Rothfuss’s effort that had at that point raised $1.1 million. That number is now $2 million. 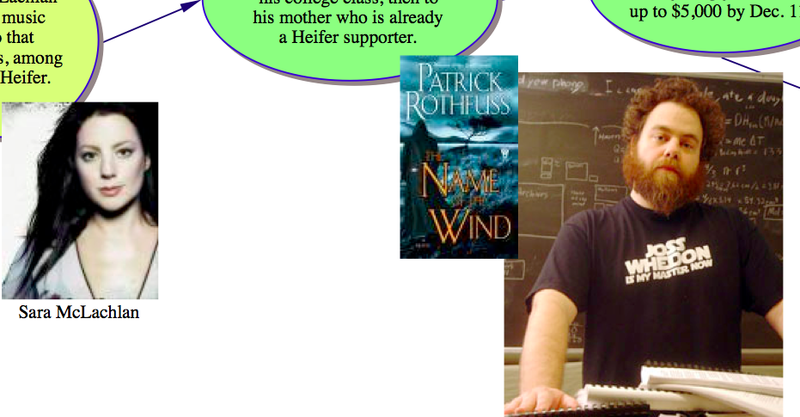 Thanks to Patrick Rothfuss, Heifer has become an important cause among fantasy, sci-fy and comic fans. And thousands of lives are improved. It’s all about relationships on- and off-line. 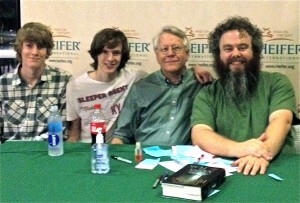 Photo from left: Eliot, Walt and Tom Peterson; Patrick Rothfuss.